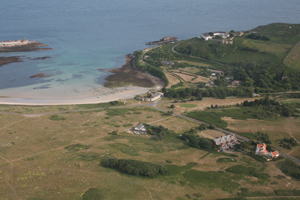 Home > Articles > News > Alderney: A New Roman Fort? Alderney: A New Roman Fort? Could an unsung and overgrown site on the Channel Islands really be one of the best-preserved military structures surviving from the Roman period? Jason Monaghan has been investigating. Alderney's enegmatic 'Nunnery' lies in the centre of the picture, dominating Longy Bay. The Tudor Essex castle lies on the headland above, while the wide expanse of Longy Common stretches out towards the bottom on the photograph. The tradition that Alderney’s oldest surviving fortification is a small Roman fort has proved persistent. Now known as ‘the Nunnery’, the site lies on a wide, flat expanse of sand overlooking Longy Bay. This natural harbour faces the French coast, eight miles distant, and served as the island’s ancient port. While several publications on Roman Britain cast the Nunnery as a military ‘signal station’, it remains an enigma. Eighteenth- and 19th-century antiquarians recognised the site was more ancient than nearby Essex Castle, which is Tudor. Yet a tendency has developed for archaeologists who investigate the Nunnery in depth to conclude it is Medieval. Could such astonishingly intact remains really be Roman? Alderney is the most northerly of the Channel Islands, and the closest to France. Only 3 miles long and 1.5 miles wide, the island has a single natural harbour, Longy Bay. This was critical to its fortunes for millennia, until the British military constructed a gigantic breakwater at Braye in 1850. Inland from Longy Bay is a wide, low-lying sand-dune field called Longy Common. Historic maps mark part of the Common as ‘the Old Town’, though there is no visible trace of settlement now. Indications of Iron Age and Roman occupation have been recorded there since the 19th century, including burial ‘cists’, walls, and roof-tile spreads. It is possible that a Roman settlement and land surface lies buried beneath up to 2m of wind-blown sand. So why is belief in a Roman origin for the Nunnery so tenacious? The answer lies in its plan. Although the eastern wall and southeast corner bastion tumbled onto the beach some time before the 18th century, giving the Nunnery its current fat L-shape, the original design can be reconstructed. The fortification would have been about 40m square, with a semicircular bastion at each of its rounded corners. In plan this style is otherwise uniquely Roman, and bears a striking resemblance to a chain of so-called ‘signal stations’ on the Yorkshire coast. Erected in the closing decades of the 4th century, when Roman control of Britain was under strain, these brought state-of-the-art defensive techniques to northern England. The Nunnery has always appeared to differ from its possible English counterparts in two ways. First, there is the apparent absence of the central internal tower that is such a distinctive feature of the Yorkshire fortifications. It was these towers, once believed to be beacon platforms, that earned the group the name ‘signal stations’. While such a tower may have been erected at the Nunnery, it was assumed that the insertion of a German personnel bunker would have destroyed any traces of it, making certainty impossible. The second difference is the stunning level of preservation. While it is rare to find defences of the Yorkshire fortlets still standing above shin height, those of the Nunnery rise 5m above the sand. High up, this stonework was laid in a herringbone pattern, while here and there, Roman tiles are visible. In places these tiles form a double row supporting crenellation stubs, preserved within the rampart when its height was later raised. Case proven, it would seem. Yet, even the credulous local antiquarians of the 19th century were wary. Excavation seemed to confirm their doubts. Digging undertaken by Migeod on the rampart circuit in the 1930s found Medieval and later material at a considerable depth. These digs also revealed that the wall stood directly on sand with little in the way of foundations. Migeod concluded this was far too sloppy for Roman workmanship. As late as 2002 a trial excavation on the line of the collapsed east rampart yielded Medieval midden-type deposits exactly where the wall construction cut was believed to be. In 2008 a joint project aiming to solve the Nunnery enigma once and for all was set up by the Alderney Society and Guernsey Museum. This harnessed the enthusiasm from a dig on Longy Common in 2007, which revealed an alignment of stones, optimistically identified as a wall, and an ancient surface over a metre below the modern turf. Lying 40m from the Nunnery gate, only Roman and Iron Age finds came from this level, confirming the presence of a buried landscape at Longy. With the support of very cooperative tenants, four seasons of excavations in the fortification followed, spanning the August bank holiday weekends, and fielding — for the most part — a very experienced team of a dozen volunteers. The continuing use of the Nunnery over the centuries complicated matters. First recorded as a military blockhouse in the 14th century, by the late 16th century it had become home to the Chamberlain family, governors of Alderney. In 1739, when English military surveyors planned it, the building was ruinous, but was refortified with cannons, before becoming a barracks and then a farm. The military were back in the Victorian period, when the Nunnery was converted to married quarters, then the Germans eagerly adapted it during the Occupation. Its latest guise is as holiday accommodation. All this activity created stratigraphy akin to that of an urban site: dug about by pits and criss-crossed by utilities. The Nunnery's Roman fortifications are remarkably well preserved. This row of pilasters running along the south wall is complete to within a course. Our 2008 excavation put a single trench against the outer face of the north wall. Here, buried land surfaces alternated with thick layers of wind-blown sand, with true Roman deposits not reached until the very lowest lens of soil and clay. Just two fragments of tile and 11 small Roman sherds were found in this, hardly a conclusive haul. Yet the diggings did reveal that the fort wall continued for almost 2m below the modern surface, giving the rampart a total height of 6.8m. Its foundations were a layer of rounded beach stones, bedded in mortar and built directly on sand. One antique reference to a ‘wooden jetty’ below the fort may indicate that the stone foundations were built on a double row of timber piles, a common Roman technique. In 2009 attention turned to the curious dogleg wall supposedly built to replace the collapsed east rampart. The design does not make a great deal of military sense, and two previous scholars have observed that the outer face of the ‘new’ wall looked older than the fort it was supposed to be repairing. Could the dogleg repair have opportunistically made use of an existing building and simply connected it to the outer circuit? Industrious volunteers stripped ivy from the ‘new’ east wall, and were rewarded by a double tile-bonding course, centred on two buttresses and running, with interruptions, for some 17m. It looked like a standing Roman wall. This is an extract. The full article can be found in issue 261 of Current Archaeology, on sale now.